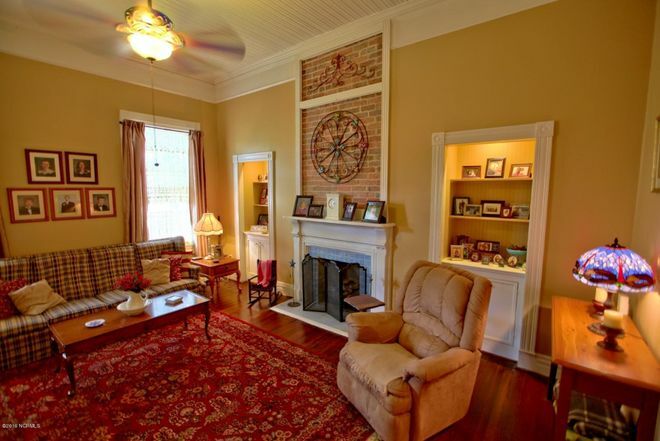 Built in 1893, this gorgeous updated farmhouse spans over 5000 square feet in the heart of Bladenboro, North Carolina. With over seventeen rooms and no less than nine fireplaces, this house is an expansive and historic homestead that combines traditional aesthetics with modern luxuries. In addition to its beautifully restored interior, this home also features a one-of-a-kind feature: a secret room with hidden access. 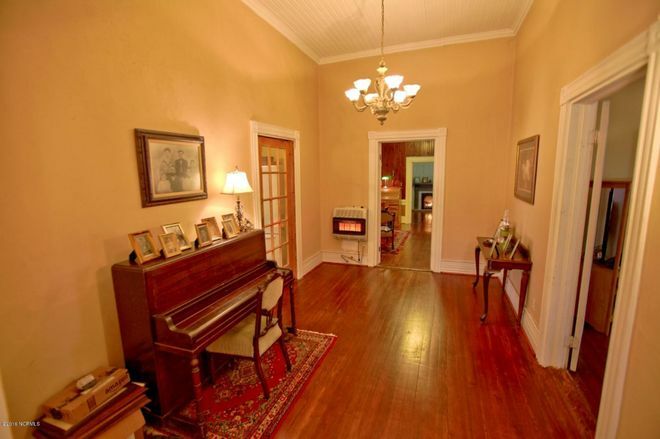 According to the house listing, "This house was built by Robert Livingston Bridger. He and his family moved in around 1896. R.L. Bridger was a prominent businessman and known as one of the founders of Bladenboro. Mr. Bridger was part owner, with his brother Henry Craven Bridger, of the Bridger Corporation ( the general merchandise store) and the Bladenboro cotton mill. R.L. 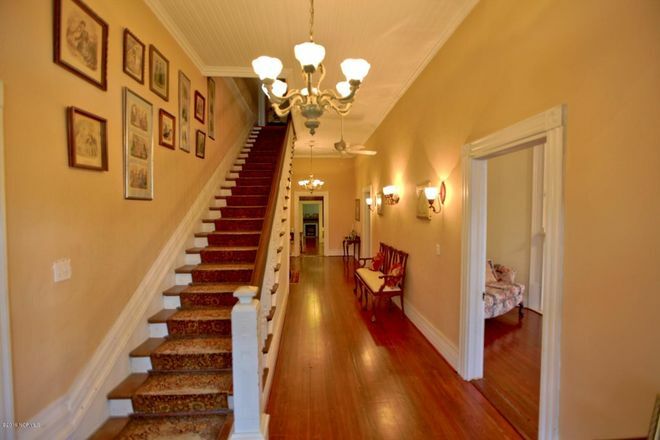 also was the president of the cotton mill, bank of Bladenboro and the Bridger Corp." This country home has a long and prominent history and is just waiting for someone to add to the next chapter of its story. With its huge wraparound porch and second-story balcony, the L.A. Bridger Homeplace has no shortage of cozy spots to relax and enjoy a warm summer day. 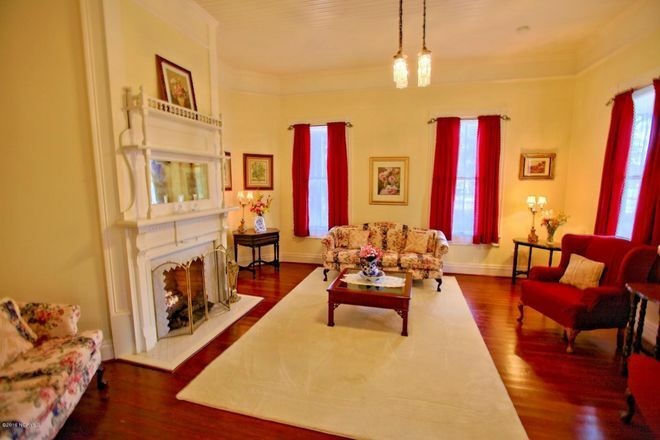 Gorgeous hardwood floors gleam throughout this home and are accented perfectly by antique and heirloom furniture. A bench in the entryway of the house fits just right between two wall sconces, providing a great spot to take a seat and take off one's coat. Bright pops of color help to accent the classic and clean woodwork on the mantle in the home's living room. High ceilings of ten to twelve feet only add to the already spacious sitting area, allowing guests the freedom to make themselves comfortable. One of the most special aspects of this estate is its maintenance of the original lighting fixtures. An upright piano, coupled with the unique chandelier-style lighting in this hallway, creates a space that hearkens back to a nearly forgotten era. The exposed brick of this room's fireplace can be utilized as a one-of-a-kind backdrop to a piece of artwork or a colorful wall hanging. Recessed shelving creates a special space to display family pictures or family heirlooms, adding to the intimacy and warmth of this space. This home's country-style kitchen captures the historical character of the home while featuring modern updates fit for the most gourmet of chefs. This room includes both a breakfast bar as well as a separate eat-in table for additional seating. 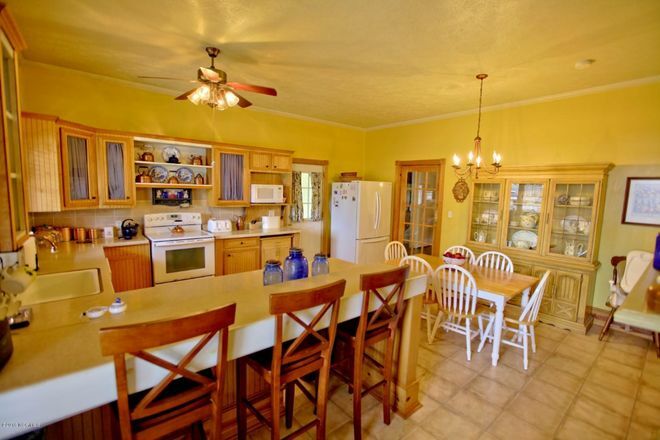 The warm hardwood cabinetry also provides ample space for displaying one's china and copper antiques. 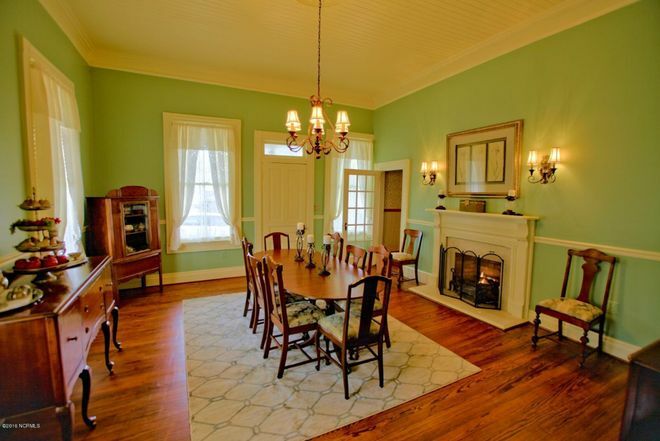 The L.A. Bridger Homeplace's formal dining room features one of the home's many working fireplaces as well as more gorgeous examples of its original light fixtures. Wrought iron candle holders on the table echo the metal accents of the fireplace, creating a stately and elegant room for holiday dinners to come. 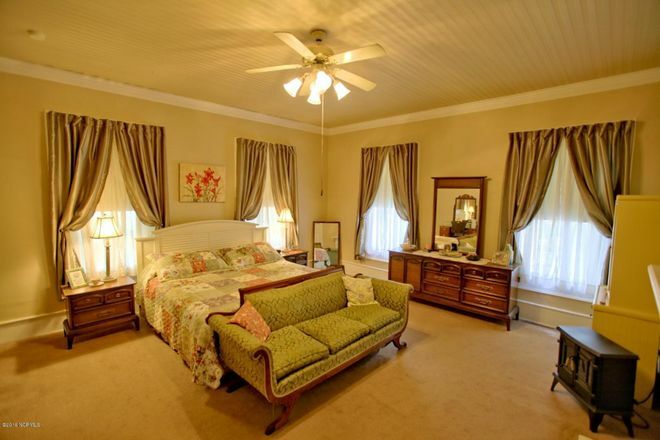 The master bedroom in this country home is full of light and space. A four-poster bed nods to the home's historic past while the rich crimson statement walls add a modern touch. 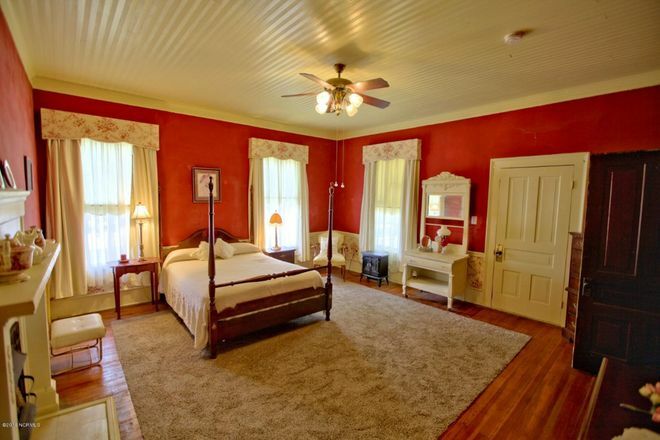 This guest room is sure to please any and all visitors to this historic farmhouse. A classic upholstered loveseat at the foot of the bed provides both a place to keep one's bag as well as a cozy spot to curl up in front of the wrought-iron fireplace. The home's study provides an ideal place to work from home. 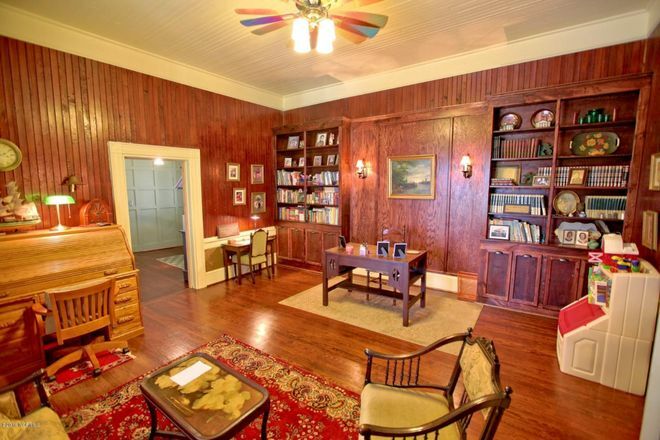 With gorgeous wood paneling and built-in shelving, this room could be utilized as a library, home office, or entertainment room. 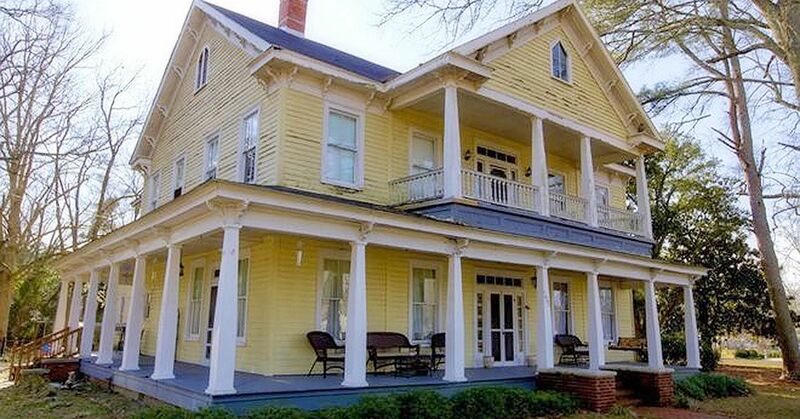 Do you love this farmhouse as much as we do? Share it with your friends!